The 2017–2018 flu season was one of the worst on record. It was the first time that flu had been classified as high severity across all age groups and led to more than 80,000 deaths. If you are like most people, the dreaded winter flu season can be scary. However, certain foods can help you fight off the flu or lower your chances of catching that nasty bug. 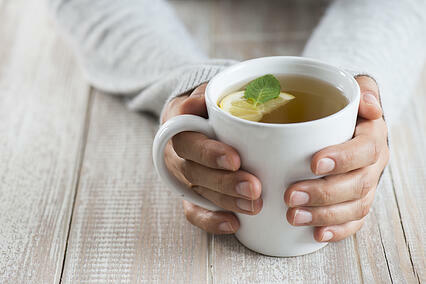 Green tea: Green tea is packed with antioxidants; sip it hot or cold throughout the day to help keep the flu away. Sweet potatoes: This bright orange food is packed with Vitamin A to help keep those free radicals at bay that can threaten to weaken your immune system. Pop a sweet potato in the microwave for 7 minutes for a quick and easy addition to lunch or dinner. Yogurt: Yogurt naturally contains probiotics that help keep your immune system healthy and strong. It's such an easy and filling snack to grab or use as a substitute for sour cream, mayonnaise, or cream in high-fat recipes. Tuna: Tuna is an excellent source of selenium and Vitamin D, which helps protect cells from free radicals and improve your immune system. Try mixing a pouch of tuna with some plain Greek yogurt and serve it atop a bed of leafy greens. Mushrooms: Mushrooms are rich in selenium, low body levels of which have been found to increase your chance of getting the flu. Chop them up and add them to a pasta dish, salad, or soup. Peanuts: This tasty snack is full of zinc, which helps keep your immune system working properly. A handful is the perfect amount to grab for an afternoon snack or to throw in a stir-fry at dinner. Water: This essential nutrient keeps the body running efficiently. Getting fluids in various forms is vital. Tea, 100% juice, coffee (preferably decaffeinated), and water-filled foods such as fruits and vegetables all count toward your hydration needs. Preheat oven to 400 degrees. Place potatoes, cut side down, on a baking sheet and roast until tender, about 30 minutes. Remove potatoes and allow to cool. Meanwhile, combine tuna, Greek yogurt, and spices in a bowl. Top potatoes with tuna and sprinkle with cheese. Place under the broiler for 1 minute or until the cheese has melted. Enjoy with a glass of green tea! As with most things, a balanced diet is the key. A diet high in a variety of produce, lean meats, whole grains, and low-fat dairy, along with moderate exercise, adequate sleep, and minimal stress, contributes the most to a well-functioning immune system and faster healing if the flu does strike. Incorporate these foods, but also continue to work on overall balance to your life.